'No matter how mundane some action might appear, keep at it long enough and it becomes a contemplative, even meditative act'. It is in such contemplative mood that the book 'What I talk about when I talk about running' presents itself. Recovering from his runner’s blues, Murakami starts to feel something beginning to stir inside him while preparing for the 2005 New York Marathon. During this process, he ruminates about his life as a runner and as a writer while asserting that writing honestly about himself and writing about running are nearly the same thing. 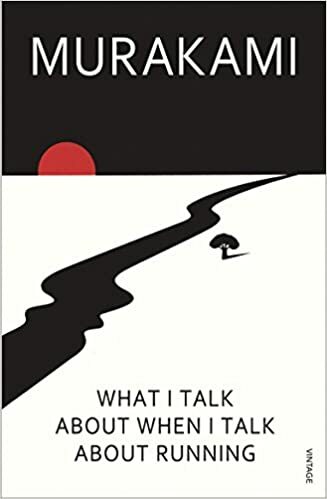 A large number of people who have read or would read this book are Murakami fans who want to know more about their favorite author’s lesser-known personal life. In my case, however, I was looking for a beginner’s memoir on running (when I first read it in October 2016). Despite my antithetical first intention, the simple yet elegant charm in Murakami's work sucked me in (and warranted a second read). He finds long distance running akin to writing a novel. He discusses a similar kind of toxin that all writers have to come face-to-face with and aware of the danger involved, discover a way to deal with it, because otherwise no creative activity in the real sense can take place. For him, running is not just an activity to keep fit for its own sake, but to keep resisting this toxin. "I run in order to acquire a void." Of course, he talks a lot about writing too, and about things that he thinks shaped him as a writer. An underlying philosophy of doing his best every single time pervades every aspect that he talks about. 'I’m the kind of person who has to totally commit to whatever I do. I just couldn’t do something clever like writing a novel while someone else ran the business. I had to give it everything I had. If I failed, I could accept that. But I knew that if I did things halfheartedly and they didn’t work out, I’d always have regrets.' He talks about being young and talented, and being old and mature - how meanings evolve and new ones emerge as we grow. Lessons, philosophy and running have been so inextricably intertwined that it's hard to talk about one and not think of the other. However, amid all this, I find that his grit eulogizes the human spirit. It certainly isn’t a hero’s tale, but definitely a heroic one. Simple observations from ordinary life create small joys. For example, during his morning walks, Murakami notices an Indian woman who apparently never repeats her outfits. The curiosity to know what dress she would wear that day serves as a small motivation to go out and run. Or, the camaraderie that Murakami feels with the triathlon athletes or the member of the S&B running team are just everyday things people do. To pick them out of the mundane and place them before the conscious mind is something Murakami has done elegantly. The prose is so rich in the use of metaphors and similes that it is palpable. What do you get when you run? Tiredness. Do more of it, you are exhausted. But what lies beyond that? Murakami’s thighs feel like old hard rubber as they start to stiffen, and end up feeling like a week old cafeteria bread while he feels like a piece of beef being run down, slowly, through a meat grinder. Maybe it is because the original book was written in Japanese and that Japanese is rich in this kind of expression, but I found it to be very appealing. Other than that, the translation extensively uses short forms - I’ll, I’d, He’d etc.. I had some trouble with the commas as they were used sparingly in most of the text. He undertook this project because he wanted to sort out what kind of life he’s led, both as a novelist and as an ordinary person. In this process, he has let his readers benefit from his share of experiences. It is a short book, full of experiences of a person. To be very honest, it is an exquisite exemplar of how chit-chat is: One thing leads to another, casually.